So this was rather different. I heard of this book first from my husband, who was reading it (albeit in Hungarian) last year. He was laughing quite a bit while he was reading it, so naturally, I was curious what it was about. This book is a detective story, but not your usual detective story. 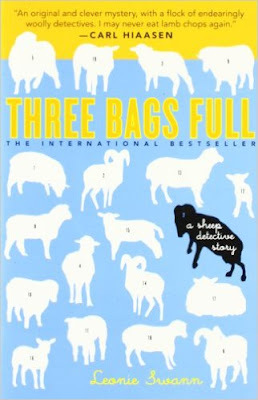 The main detective isn’t human, but a herd of sheep. See, this book opens with a death, the death of George, a shepherd. George was an old and rather unique shepherd, who read romance novels to his sheep. The sheep refer to these novels as the Pamela stories, as they often feature hot babes with the name Pamela. One day, they find their shepherd dead, in the middle of the field, with a spade driven in the middle of his body. So the sheep decided that they would try to find out who killed their shepherd. After all, their shepherd also read detective novels to them, so they know how to do it, or so they think. If there is one suspension of disbelief that is required of the reader, it is that the sheep understands English. They seem to understand what humans say, and therefore this allows them to catch clues and deduce things. It actually is a bizarre thing, but somehow, as long as you buy it, this novel definitely entertains. Perhaps one thing that I like about this novel is its pace. It is not an airport novel. It doesn’t make you turn the page as fast as you can. It alters the pace back and forth, allowing the reader to digest what’s happening. After all, the reader has to switch back and forth between two perspectives, those of humans and those of sheep. And this is what I think is great about this novel. It describes human behavior through the perspective of sheep every now and then, and it makes the reader aware how absurd some of human behavior can be. I am not going to tell you who killed George. That’s up to you to find out. But I should say that I had a good time guessing. You make guesses, and then you get further evidence, and sometimes you have to revise your guess. You think that one person is a bad guy, and then after learning more about him, you then think that he isn’t as bad as you thought he was. And vice versa. And sometimes, there are passages that would make you suspect that the killer isn’t human but rather a sheep. So overall, I did enjoy this book. I give it 4 out of 5 stars.